Much of the talk about the deal with Iran over its nuclear program has ignored the potential impact of removing oil-export sanctions on the country. The spread of nuclear weapons is a concern, but the impact of Iran's deal would be felt by U.S. oil producers. While the world watches as Iran and the U.S., along with five other world powers -- the so-called "P5+1" -- negotiate a deal regarding the country's nuclear ambitions, fellow Middle-East power Saudi Arabia isn't sitting still. The Saudis have actually been working on developing energy from alternatives to oil since former King Abdullah established a center for atomic and alternative energy in 2010. Raising the ante, the country recently signed a nuclear cooperation agreement with South Korea, even as rival Iran inches closer to an agreement to allow it to continue its own nuclear ambitions. A recent Wall Street Journal article even brought up the potential risk of Saudi Arabia using its partnership with Pakistan to have access to nuclear weapons as a response to the threat of a nuclear Iran. These are real concerns; but nuclear proliferation has been a world risk for 70 years now, since the U.S. developed the first hydrogen bomb. I don't want to downplay that risk; however, there's another side to this story that shouldn't be ignored. It may have very real economic consequences for the American oil industry, which is not an insignificant part of the U.S. economy, and has been one of the brightest spots in our jobs recovery. In 2011, Iran exported 2.5 million barrels of oil per day. By 2013, exports had plummeted to 1.1 mmb/d following sanctions based on the country's continued attempts to develop nuclear technology. Iran exported roughly 1.4 mmb/d in 2014. At the same time, American shale production was cranking into high gear. In 2013, U.S. oil production was 7.45 mmb/d, and increased an astonishing 1.2 mmb/d last year. Considering that oil is a largely global commodity, it's not much of a stretch to view U.S. production growth as essentially offsetting the cuts to Iranian output in recent years. That's happened without more than 1 million daily barrels of Iranian oil, which could be coming back online very soon. On March 19, West Texas Intermediate, a common benchmark for U.S.-produced oil prices, almost fell below $43/bbl, and has been trading near or below its low since the 2009 recession for much of the past week. This has been driven by concerns that U.S. production has continued to grow even as the oil market remains oversupplied. Iran's nuclear program has been around for 35 years. The U.S. was instrumental in its early days, and even American utilities used it to market nuclear power as safe. At the same time, the negotiations with Iran could lead to the country pouring hundreds of thousands of new barrels of supply into an already oversupplied market, as soon as this summer. The country is starving for cash, and even with Brent crude -- the international benchmark -- trading below $55 per barrel, Iran could pour as much as 1 million barrels per day in new supply into the market "within a few months," according to Iranian Oil Minister Bijan Zanganeh. At the same time, American oil producers have reduced spending on development of new wells by tens of billions of dollars since late 2014. This has resulted in significant cuts in drilling activity so far this year. Through March 16, there were almost 600 fewer drilling rigs operating in oil fields in the U.S., more than a 40% reduction from year-ago levels. 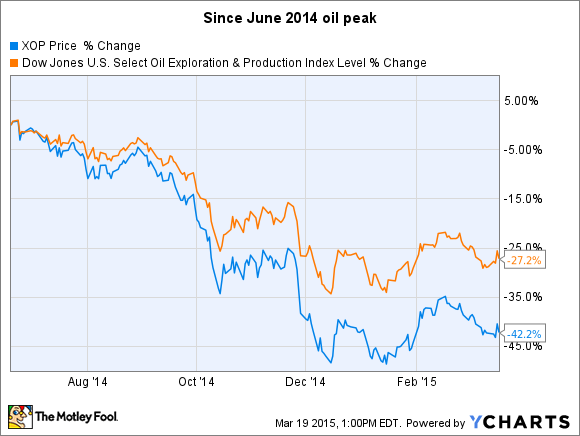 However, the drilling cuts are yet to materially affect oil production, which is actually up so far in 2015. This is why, after a slight rebound in oil prices in late January and early February, prices have been steadily falling, on concerns about the continual oversupply in the global and domestic oil market. While it's been slow to materialize, American oil output is expected to begin flattening in the next few months. Though it's unclear if production will actually decrease, at this point, flat U.S. production would likely reestablish some balance in the market, and lead to a recovery in oil prices. The Iran situation could significantly change the game, though. The way things are unfolding, Iran would begin ramping up its production just as U.S. output stabilizes, meaning the current global oversupply continues. 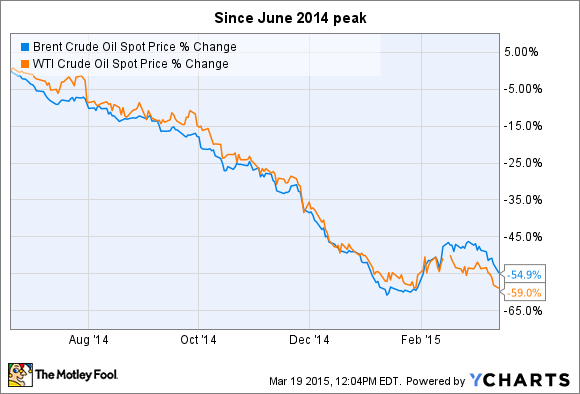 This would very likely keep oil prices down for an impossible-to-determine period of time. The Dow Jones U.S. Select Oil Exploration and Production Index has declined 27% since oil prices peaked in June; but it's important to note that this index isn't really a good measure of U.S. producers. As a starting point, it's market-cap weighted, which means that ConocoPhillips, a U.S.-based international producer, makes up 13% of the index, while several refiners -- which can actually benefit from falling oil prices -- make up another 18% of the index. The SPDR S&P Oil & Gas Explore & Prod. (ETF) (NYSEMKT:XOP), on the other hand, is almost exclusively made up of independent U.S. producers, which are bearing the full brunt of falling oil prices. While the majority of U.S. producers have enough capital to ride out the current environment, Iran's million-barrel addition to the market could change the dynamic quickly for producers with limited resources. Even the best-managed and capitalized producers would likely be forced to make further cuts to drilling, and potentially, even some marginal production if prices stay low for an extended period of time. While low oil prices are good for consumers, because oil is used for everything from a feedstock for manufacturing to the primary fuel for shipping, cheap oil means lower prices. However, there has already been some impact on domestic jobs in the industry, while many states that depend on taxes from oil producers will also feel a pinch. The double whammy here is more people potentially depending on government assistance, while the resources that help fund those services falls. Many in the industry doubt just how much sustained production Iran could generate at this point, because the country quite frankly hasn't had the money to invest in maintaining its oilfields with the current sanctions in place. Many in the industry doubt that it could sustainably produce 800,000 bbl/d at this point, and that it could take a year or more for the necessary investments to get the country to even that point on a sustained basis. However, there's little reason to doubt that the international community and Iran are likely, at this point, to reach an agreement that allows the country to turn the oil pumps back on, increase exports substantially, and reclaim its former place as the No. 2 OPEC producer behind its rival Saudi Arabia. While only time will tell how quickly -- and how much -- Iran can scale up its oil production, it's not likely going to be a good thing for U.S oil producers. That, in turn, is likely to be harmful for investors looking for a rebound in oil producer stocks, and further the damage to those already investing in the industry. Oil pumpjack near Midland, Texas.